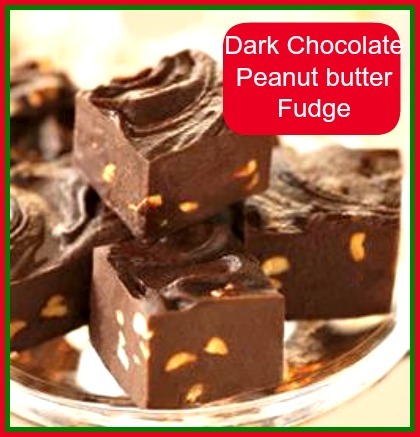 This Dark Chocolate Peanut Butter Fudge is simple and easy to make and takes no time at all to prepare. The recipe combines frosting, peanut butter and nuts and makes a sinfully delicious treat. If you love making fudge, be sure to check out my tips for making perfect fudge here. They will give you great results every time. You can substitute crunchy peanut butter to save even more time, but I prefer the taste of real nuts. Almonds or cashews could be used in place of peanuts. For more great dessert ideas, please visit The Gardening Cook on Facebook. What is your favorite type of fudge? Please leave your suggestions in the comments below. Line an 8x8-inch square pan with foil, extending foil up to top edge of pan. Coat with the Pam cooking spray. Place the chocolate chips and butter in large microwave-safe bowl. Microwave on HIGH 1 minute. Stir until smooth. Blend in frosting and peanut butter until combined. Microwave on HIGH 90 seconds. Add the nuts and vanilla extract. Pour evenly into prepared pan. Chill for 1 hour or until firm. Use the edges of the foil to lift the fudge out of the pan. Cut into bite-sized pieces. Store in refrigerator.